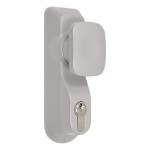 The Briton 1413E.KE.SE Knob Outside Access Device is created to work with the Briton 376 series. As standard, it comes complete with a eurocylinder. It is compatible with doors that have a thickness between 40mm and 70mm, and comes complete with fixings for timber and metal door-sets. It comes supplied with a euro profile cylinder as standard, and due to it's compatibility, it can easily be installed with any of the vertical panic bolts and panic bars within the Briton 376 collection. Got this to go along with my Briton panic bar and it works perfectly, great product.